The Archangel Gabriel Orthodox Church has been meeting for 20 years at the Walsh Memorial Newman center just above the Southern Oregon University campus but, says Father Andreas Blom, priest of the church, the congregation has grown to exceed 150 members and has outgrown its current facility. They’ve been holding services in recent weeks at the Shops at Exit 24 in Phoenix and will continue to do so, he said, until they raise enough money to break ground on the church. It will be 45 feet high, with a spherical dome in the Orthodox style, not the Russian style with onion domes. The church owns seven acres in the 600 block of South Valley View Drive. The property is north of Interstate 5 and south of West Butler Lane, near the on-ramp heading north on I-5. 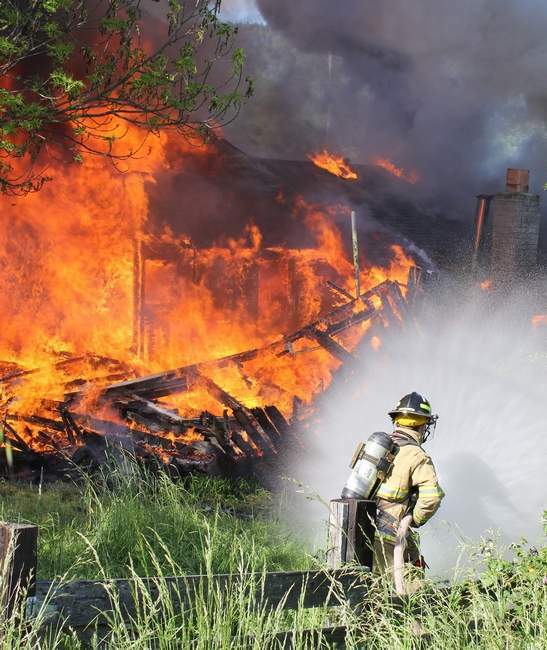 They had a dramatic burn-to-learn exercise performed by Fire District 5 Thursday morning, clearing the land for the church. Architects drawings of the 3,150-square-foot church are not yet available. Fundraising for $1.5 million is underway among the Orthodox Church at large and the Ashland-based church, he said. At services, parishioners stand the whole time and sing the entire service a capella, using no musical instruments, the way it was done in ancient times, he notes. Fr. Andreas says the building of the church here is historic, as there has never been a full-scale Orthodox church built in Southern Oregon, although Orthodox people have worshipped in the region for decades. The church’s website, www.stgabrielashland.org, says a parishioner last year gave them an interest-free loan to buy the land and get started on the church. All county permits have been obtained, he adds. County records show approval was granted at the staff level in 2014. The plans call for a community garden, orchard, a cemetery, landscaping and fellowship hall. The church phone number is 541-690-8822. A few corrections are in order, as always. The “the first-ever Orthodox Christian church in Southern Oregon” could be misconstrued to mean that our parish is the first (or only) Orthodox group to exist in Southern Oregon. We make no such claim, and that is not the point – but rather that this temple, if God would grant us to complete it, would be the first full-scale and permanent Orthodox Church south of Eugene. There is a Russian Orthodox parish in Rogue River, and a Greek Orthodox mission in Roseburg. Even though we have 150 people on the parish roster, we are rarely more than 70-90 people at Sunday Liturgy. The parish has not applied for a cemetery, and it has therefore not yet been approved by the county.